In his History of Early Rome, the ancient historian Livy tells the story of a Roman girl named Cloelia who was taken prisoner by Larth Porsena, the king of the Etruscans. Cloelia came up with a daring plan of escape from her Etruscan captors and in the process won the admiration of all Rome and of the Etruscan king himself, who freed her. For saving her city, a grateful Rome set up a statue in her honor, the first such ever to be put on the Sacred Way. 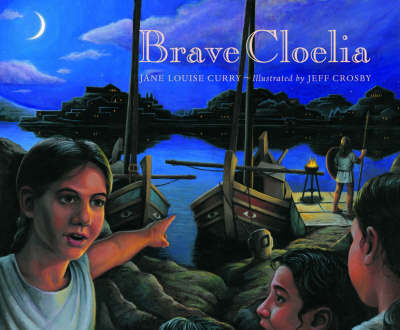 Jane Louise Curry tells this exciting and true story in Brave Cloelia, beautifully illustrated by Jeff Crosby. Jane Louise Curry is the author of many books for young people, most recently Hold Up the Sky and Other Indian Tales of Texas and the Southwest and The Egyptian Box. Brave Cloelia is his sixth children's book.